"A vertical wood fence is a great option for someone who’s new to fence building or wants an easier process." In the first installment of this series on how to build a fence, we talked about installing fence posts. 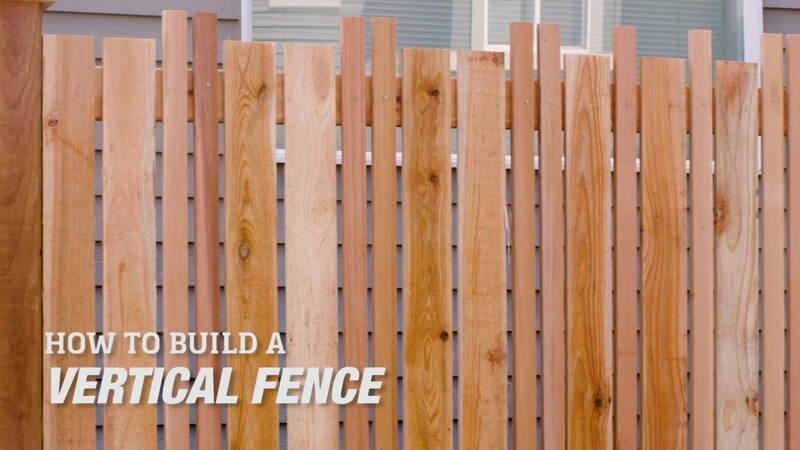 Learn how to build two other types of fences by visiting our horizontal board fence and framed-panel fence tutorials—and prolong your fence with LifeTime Wood Treatment. Once you've set the fence posts, you're ready to build a fence with vertical cedar boards (sometimes called a vertical fence). Of course, all fences are vertical to the ground, but when we say vertical fence in this context, we’re talking about the orientation of the boards. The first step is to install two horizontal two-by-fours between your posts. These boards are called fence rails, and your vertical fence boards will be fastened to them later on. The most common height for a fence is six feet. 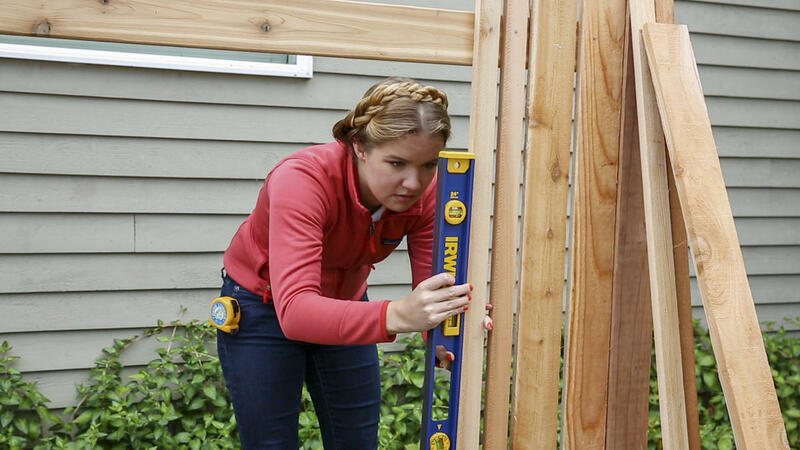 The fence we’re building today is shorter than six feet, but the steps are the same for a six-foot-tall fence. You can build a fence that’s any height you’d like, so long as you check with your city or local municipality for restrictions. Let’s launch into building a section of a vertical cedar fence. The most common design for vertical fence panels is called “estate,” which is solid boards of the same width with virtually no gap between them. It’s a good choice if you want a privacy fence, but you might want to mix things up a bit. You’ll find that cedar fence boards come in different widths, lengths, and even thicknesses, so there’s lots of mixing up you can do. Consider using boards of different widths, adding a bit of space between boards, or having some boards taller than others. There are lots of places you can go for inspiration—try looking at other fences around your neighborhood or scrolling through Pinterest, then sketch out your design. Next, mark the height for the rails on the posts. 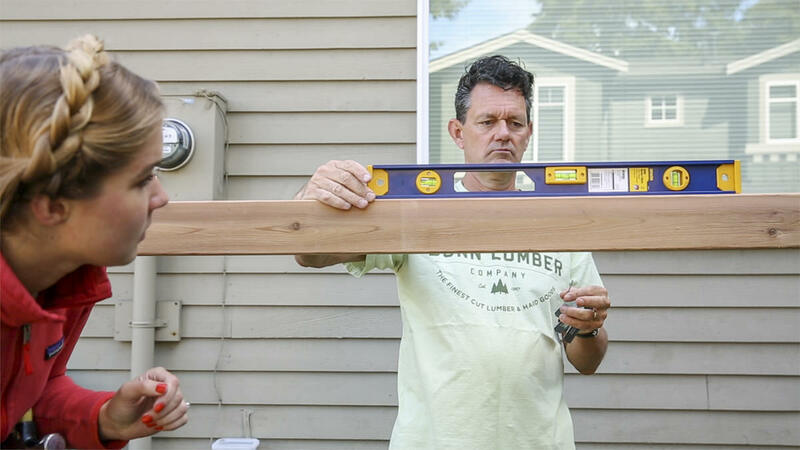 You’ll have two marks, because one rail is usually placed a few inches down from the top of the posts, and the other is placed a few inches up from the ground. Fence rails are also generally centered (front to back) on the post, and are usually on-edge so there’s less sag in the board. That said, you can mount your fence rail flat if your design calls for that. 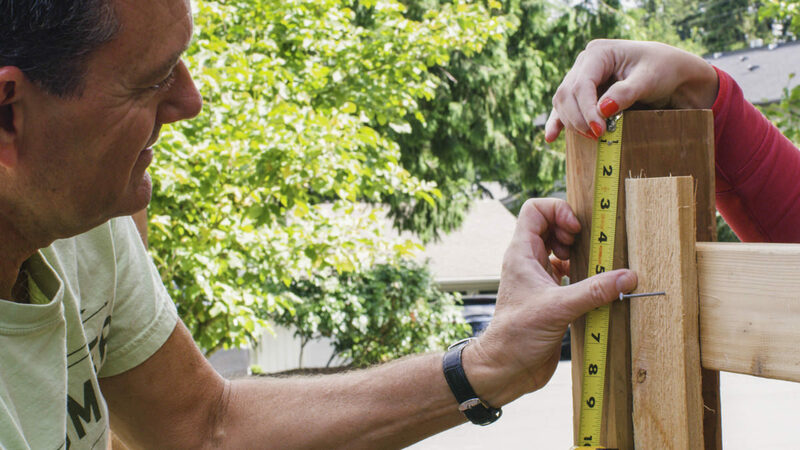 Measure between the posts at the heights marked, then cut your two-by-four rails to a length that’s just a bit shorter than that measurement—the rail will just slip in between the posts. If you’re using fence clips (see below! ), you’ll need to cut the rail a little shorter than you would if you were using nails or screws. 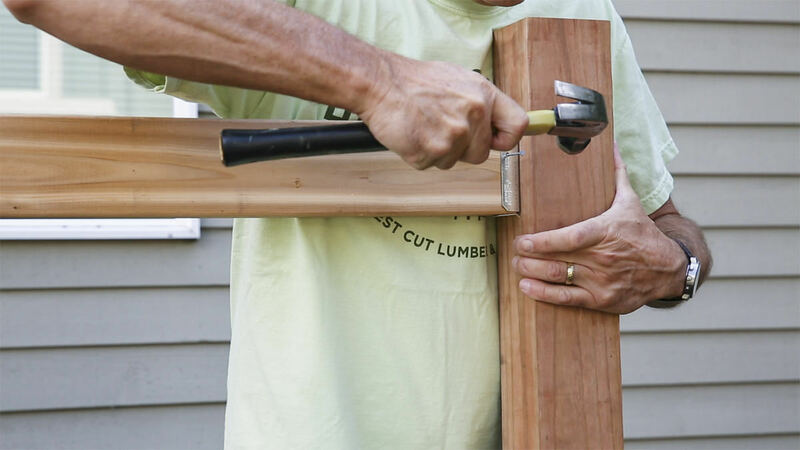 Once your rails are cut to length, attach each end of both rails to the post with nails, screws, or fence clips. If you're using nails or screws, drive a couple fasteners at an angle through the end of the rail and into the post. The other option is fence clips, which are metal brackets that are mounted onto the post first and hold the fence rail in place. This is what we used. Many people find using fence clips makes fence building easier, but keep in mind that they will show—unless your fence design specifically covers them. Now that you have your fence rails spanning between posts, it's time to attach the boards. 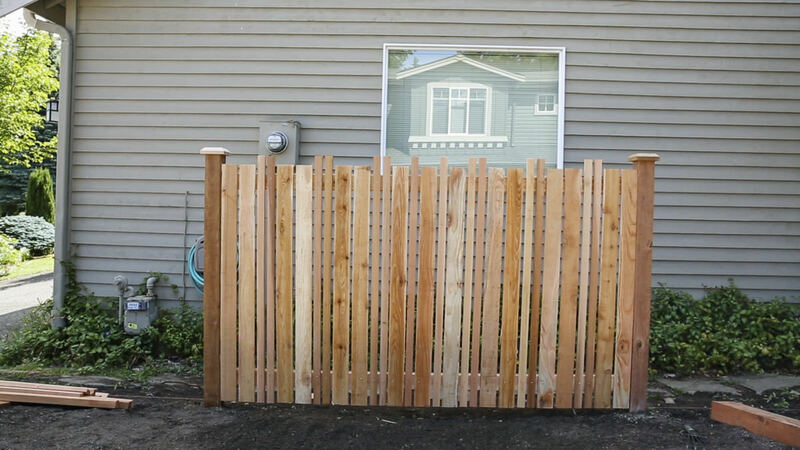 The look we went with today mixes one-by-twos with one-by-four cedar fence boards. We cut the one-by-twos four inches longer than the one-by-fours, and designed a three-quarter-inch gap between boards. 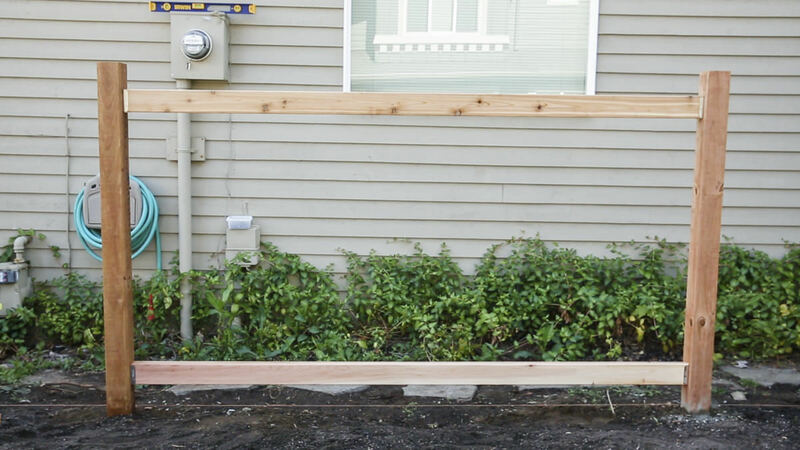 If you like, it can be helpful to string a line between posts where the tops of your fence boards will be so that they follow that straight line. Make sure to leave a gap between the bottom of the fence boards and the ground; contact between the wood and the ground will promote rot. Start by nailing a one-by-four to the rail right next to the post. Placing it there hides the fence clip from this side of the fence. Then, using a one-by-two as a spacer, nail another one-by-four into place. Using the spacer again, nail two one by-twos. Repeat this pattern all the way until you reach the other post, stopping every few boards to check that the boards are vertical (use a level for this). If symmetry is important to you, work toward the center of the rail from both posts and adjust your pattern (or spacing) as you meet in the middle. That’s it! Add fence post caps, and you're set. A vertical board fence is the easiest of the three types of fences we'll be covering, which makes it a great option for someone who’s new to fence building or wants an easier process. 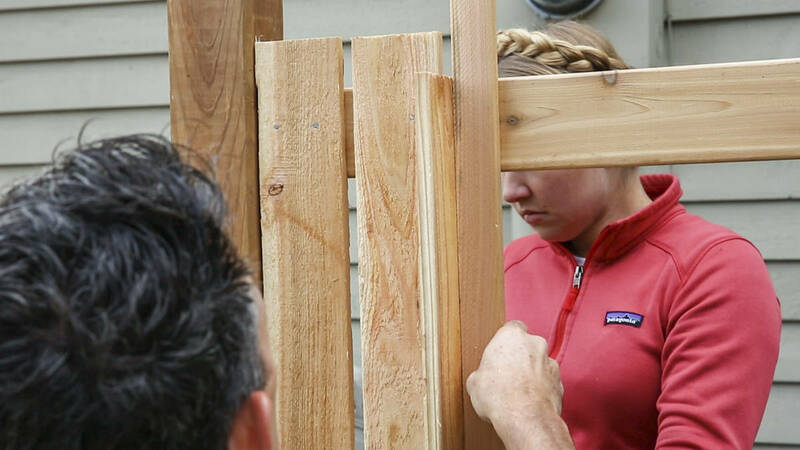 Stay tuned for the rest of this series, where we’ll cover how to build a horizontal-panel fence and a framed-panel fence.